Join us for an unforgettable evening at the Kunstbruder cafe & gallery! Grab a glass of wine and go around the gallery admiring and discussing with other InterNations Members about art. Not interested in art? No problem, get a cocktail, have a seat on the elegant Danish design chairs and relax while getting to know the person next to you. If hunger strikes you, pick up the menu and order one of the amazing dishes offered by the skilled chefs at Kunstbruder. 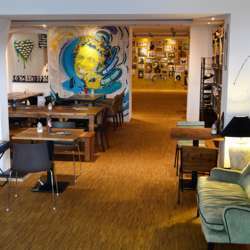 It's art evening because at Kunstbruder you get art on the walls, art in the glass and art on the plate!